It is time for another ATOM AotM. This month, we return to the energy sector, for it is where the greatest size and scale of ATOM disruptions are currently underway. We visited batteries briefly in August 2017's ATOM AotM. There are two exponentials here, battery cost per unit of energy, and battery energy density per unit volume. Hence, despite 40 years of apparent stagnation interspersed with angst about how electric vehicles failed to arrive in response to 1973 and 1981 oil spikes, the exponential trend quietly progressed towards the inflection point that we have arrived at. True to the exponential nature of technology, more progress happened in 2011-20 than 1970-2010, and we now have viable electric vehicles that are selling rapidly and are set to displace gasoline consumption in a matter of just a few short years. Electric vehicles are now 2% of all new vehicle sales in the US, and 3% worldwide, with a high annual growth rate. Due to the rapid cost improvements in EVs expected in the next three years, a substantial tipping point is perhaps no more than three years away. This rapid rise is in the face of two major headwinds : the low price of oil (due to another ATOM disruption), and the high price of EVs (the top-seller in units is a $50,000 vehicle). It is now a certainty that once a high-quality EV becomes available at the $30,000 pricepoint, the speed of displacement will be startling. A tracker that records monthly sales at both US and WW levels is here. The speed of advancement merits monthly visits to this tracker, at this point. Note that over time, the US is actually where total displacement of ICEs by EVs will be the slowest, since other countries are more suited for EVs than the US (they have higher gasoline prices, and often 220V electrical outlets that lead to faster charging). In fact, a suddenly popular home upgrade in the US is, ironically, the installation of 220V outlets in the garage, specifically for EV charging. As an example of a true ATOM disruption, the transformation will be multi-layered. From oil import/export balances, to gasoline refinement and distribution networks, to the reduction of near-slave labor from the Subcontinent forced to find work in Gulf petrostates, to mechanics dependent on ICE vehicle malfunctions, to surplus used ICEs unable to sell and thus forced to slash prices, to power management and pricing by electric utilities, to prime land occupied by gas stations, a variety of status quos will end. Don't underestimate how soon the domino effect will take place. Once EVs are sufficiently mainstreamed in the luxury car market (which is set to happen in 2019), then the entire range of urban commercial/government vehicles will swiftly transition to electric. The US has 800,000 police cars, 210,000 USPS vans, and a variety of other government vehicles. On top of that, private enterprises include 110,000 UPS vehicles, 60,000 FedEx vehicles, and perhaps over 300,000 pizza delivery vehicles. As these transition, observe how many gasoline stations shutter. The much greater lifespan of EVs relative to ICE's will be one of the four factors that lead to the majority of automobile use migrating to an on-demand, autonomous vehicle model by 2032, as discussed before. For the August 2017 ATOM AotM, we will bend one of the rules. The rule is that a disruption already has to have begun, and be presently underway. But this time, a conversation in the last month's comments brought forth a vision of a quad-layer disruption that is already in the early stages and will manifest in no more than 15 years time. When fully underway, this disruption will further tighten the screws on government bodies that are far too sclerotic to adapt to the speed of the ATOM. To start, we will list out the progression of each of the four disruptions separately. 1) Batteries are improving quickly, and while electric vehicles are not yet competitive in terms of cost and charging speeds (partly due to the true cost of imported oil not being directly visible to consumers). 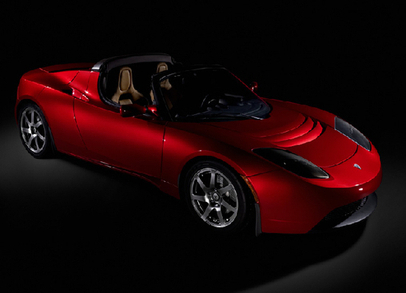 At the same time, an electric car has far fewer moving parts, and fewer liquids to deal with. By many estimates, an electric car can last 300,000 before significant deterioration occurs, vs. 150,000 for an internal combustion engine car. Now, under the current ownership model, a car is driven only 12,000 miles/year and is parked 90% of the time or more. The second half of an electric vehicle's lifetime (150,001-300,000 miles) would only begin in year 13 and extend until year 25 of ownership, which is not practical. If only there were a way to avoid having the car remain idle 90% of the time, occupying parking spaces. It may take until 2032 for electric cars to compress the cost delta to the extent of being superior to ICE cars in total ownership costs for the early years, which then leads to the dividend available in the later years of the electric car's life. 2) Autonomous vehicles are a very overhyped technology. Stanford University demonstrated an early prototype in 2007. Yet even a decade later, a fully autonomous car that operates without any human involvement, let alone the benefit of having a network of such cars, seems scarcely any closer. Eventually, by about 2032, cars will be fully autonomous, widely adopted, and communicate with each other, greatly increasing driving efficiency through high speeds and far less distance between cars than humans can manage. Uber-like services will cost 60-80% less than they do now, since the earnings of the human driver are no longer an element of cost, and Uber charges just 20-30% of the fare itself. It will be cheaper for almost everyone to take the on-demand service all the time, than to own a car outright or even take the bus. If such a car is driven 20 hours a day, it can in fact accrue 300,000 miles in just 5 years of use. This effectively is the only way that electric cars can be driven all the way up to the 300,000 limit. 3) The displacement of brick and mortar retail by e-commerce has far greater implications for the US than for any other country, given the excessive level of land devoted to retails stores and their parking lots. The most grotesque example of this is in Silicon Valley itself (and to a lesser extent, Los Angeles), where vast retail strip mall parking lots are largely empty, yet are within walking distance of tall, narrow townhouses that cost $1.5M despite taking up footprints of barely 600 sqft each. As the closure of more retail stores progresses, and on-demand car usage reduces the need for so many parking spaces, these vast tracts of land can be diverted for another purpose. In major California metros, the economically and morally sound strategy would be to convert the land into multi-story buildings, preferentially residential. But extreme regulatory hurdles and resistance towards construction of any new housing supply will leave this land as dead capital for as long as the obstructionists can manage. But in the vast open suburbs of the American interior, land is about to go from plentiful to extremely plentiful. If you think yards in the suburbs of interior cities are large, wait until most of their nearby strip malls are available for redevelopment, and the only two choices are either residential land or office buildings (there are more than enough parks and golf courses in those locations already). Areas where population is already flat or declining will have little choice but to build even more, and hope that ultra-low real estate costs can attract businesses (this will be no problem at all if the ATOM-DUES program is implemented by then). This disruption is not nearly as much a factor in any country other than the US and, to a lesser extent, Australia, as other countries did not misallocate so much land to retail (and the associated parking lots) in the first place. 4) This fourth disruption is not as essential to this future as the first three, but is highly desirable, simply due to how overdue the disruption is. It is quite shocking that the least productive industry in the private sector relative to 50 years ago is not education, not medicine, but construction. US construction productivity has fallen over the last 50 years. Not merely failed to rise, mind you, but outright declined in absolute terms. But remember, under ATOM principles, the more overdue a disruption is, and the more artificial the obstructions thwarting it, the more sudden it is when it eventually happens. China is not held back by the factors that have led to the abysmally low productivity in US construction, and when there is so much retail land to repurpose, pressure to revive that dead capital will just become too great, even if that means Chinese construction companies have to come in to provide what the US counterparts cannot. This pressure could be the catalyst of the long overdue construction productivity catchup. This topic warrants a lengthy article of its own, but that is for another day. Hence, the first three factors, and possibly the fourth, combine by 2032 to generate a disruption that will be so comprehensive in the US that the inability of government to change zoning laws and permitting at anything close to the speed of market demand will be greatly exposed. The first disruption, batteries, alone could be an ATOM AotM, but this time, the cumulative disruption from these multiple factors, even if it will take the next 15 years to accomplish, gets the award. It is that time of the month again. For our third ever award of the ATOM AotM, we return to an article I wrote over 10 years ago about the lighting revolution. At that time, when the disruption was still in the future, I highlighted how the humble status of the light fixture leads to an associated disruption going widely unnoticed. That continues to be true even today, despite the important product transition that most people have already undertaken. So the ATOM AotM award for March 2017 goes to the LED lightbulb. Something that most people do not even notice is a major engine of the ATOM, as it has introduced rapid price/performance improvements into what used to be a stagnant product. Charge of the Light Brigade : Remember that the average household has about 25 light bulbs on average. From the chart, we can see that light output per until of energy and cost per watt of LED lighting are both improving rapidly, leading to a double-exponential effect. Lighting is hence now fully in the path of the ATOM and is seeing progress at a rate entirely beyond what the predecessor technology could have have experienced, and is indeed one of the fastest technology shifts ever (see the second chart). Bulbs are now purchased in packs of 4-12 units, rather than the single-unit purchases of the recent past. The expected electricity savings worldwide are estimated to be over $100 Billion per year in the near future. 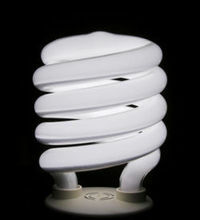 LED bulbs are reducing the electricity consumed by lighting. This reduction in demand more than accommodates the proliferation of electric cars. The first 100 million electric cars worldwide (a level we are still extremely far from) will merely offset the loss of electricity demand for lighting. The spread of electric cars with no net rise in electricity consumption nonetheless reduces oil consumption and hence oil imports. The US already has a trade surplus with OPEC, for the first time in half a century, and this force is strengthening further. Even if the price per barrel of oil had not fallen through fracking, the number of imported barrels still would have plunged. So even though most lighting is not fueled by oil, it created a puncture point through which a second-degree blow to oil demand arose. That is truly amazing, making LED lighting not just a component of the ATOM but one of the largest disruptions currently underway. That concludes this month's ATOM AotM. I need more reader submissions to ensure we have a good award each month. With the new year, we are starting a new article series here at The Futurist. The theme will be a recognition of exceptional innovation. Candidates can be any industry, corporation, or individual that has created an innovation exemplifying the very best of technological disruption. The more ATOM principles exhibited in an innovation (rising living standards, deflation acting in proportion to prior inflation in the incumbent industry, rapid continuous technological improvement, etc. ), the greater the chance of qualification. The inaugural winner of the ATOM Award of the Month is the US hydraulic fracturing industry. While 'fracking' garnered the most news in 2011-13, the rapid technological improvements continued. Natural gas continues to hover around just $3, making the US one of the most competitive countries in industries where natural gas is a large input. Oil prices continue to fall due to ever-improving efficiencies, and from the chart, we can see how many of the largest fields have seen breakevens fall from $80 to under $40 in just the brief 2013-16 period. This is of profound importance, because now even $50 is a profitable price for US shale oil. There is no indication that this trend of lower breakeven prices has stopped. Keep in mind that the massive shale formations in California are not even being accessed yet due to radical obstruction, but a breakeven of $30 or lower ensure the pressure to extract this profit from the Monterrey shale continues to rise. Beyond that, Canada has not yet begun fracking of its own, and when it does, it will certainly have at least as much additional oil as the US found. This increase, which is just an extra 3M barrels/day to US supply, was nonetheless enough to capsize this highly elastic market and crash world oil prices from $100+ to about $50. Given the improving breakevens, and possibility of new production, this will continue to pressure oil prices for the foreseeable future. This has led to the US turning the tables on OPEC and reversing a large trade deficit into what is now a surplus. If you told any of those 'peak oil' Malthusians that the US would soon have a trade surplus with OPEC, they would have branded you as a lunatic. Note how that ill-informed Maoist-Malthusian cult utterly vanished. Furthermore, this plunge in oil prices has strengthened the economies of other countries that import most of their oil, from Japan to India. Under ATOM principles, technology always finds a way to lower the cost of something that has become artificially expensive and is hence obstructing the advancement of other technologies. Oil was a premier example of this, as almost all technological innovation is done in countries that have to import large portions of their oil, while almost none is done by oil exporters. Excess wealth accumulation by oil exporters was an anti-technology impediment, and demanded the attention of a good portion of the ATOM. Remember that the worldwide ATOM is of an ever rising size, and comprises of the sum total of all technological products in production at a given time (currently, about 2% of world GDP). Hence, all technological disruptions are interconnected, and when the ATOM is freed up from the completion of a certain disruption, that amount of disruptive capacity becomes available to tackle something new. Given the size of this disruption to oil prices and production geography, this occupied a large portion of the ATOM for a few years, which means a lot of ATOM capacity is now free to act elsewhere. This disruption was also one of the most famous predictions of mine here at The Futurist. In 2011, I predicted that high oil prices was effectively a form of burning a candle at both ends and such prices were jolting at least six compensating technologies into overdrive. I provided an equation predicting when oil would topple, and it toppled well in accordance with that prediction (even sooner than the equation estimated). This concludes our very first ATOM AotM to kick off the new year. I need candidate submissions from readers in order to get a good pool to select from. Criteria include the size and scope of the disruption, how anti-technology the disrupted incumbent was, and an obvious improvement in the quality of a large number of lives through this disruption. MIT Technology Review has an article describing how Tesla Motors has brought rapid disruption to the previously staid auto industry, where there are too many factors precluding the entry of new companies. But this is nothing new for readers of The Futurist, as I specifically identified Tesla as a key candidate for disruption way back in 2006. In Venture Capital terms, this was an exceptionally good pick such an early stage. In ATOM terms, the progress of Tesla is an example of everything from how all technological disruptions are interlinked, to how each disruption is deflationary in nature. It is not just about the early progress towards electric cars, removal of the dealership layer of distribution, or the recent erratic progress of semi-autonomous driving. Among other things, Tesla has introduced lower-key but huge innovations such as remote wireless software upgrades of the customer fleet, which itself is a paradigm shift towards rapidly-iterating product improvement. In true ATOM form, the accelerating rate of technological change is beginning to sweep the automobile along with it. When Tesla eventually manages to release a sub-$35,000 vehicle, the precedents set in dealership displacement, continual wireless upgrades, and semi-autonomous driving will suddenly all be available across hundreds of thousands of cars, surprising unprepared observers but proceeding precisely along the expected ATOM trajectory. I refer readers back to an article written here in 2011, titled 'The End of Petrotyranny', where I claimed that high oil prices were rapidly burning through the buffer that was shielding oil from technological disruption. I quantified the buffer in an equation, and even provided a point value to how much of the buffer was still remaining at the time. Go to the original article to see various scenarios of how the dollar-years could have been depleted. While we have not used up the full 200 dollar-years to date, the range of scenarios is now much tighter, particularly since fracking in the US continues to lower its breakeven threshold. At present, over $2T/year that was flowing from oil importers to oil producers, has now vanished, to the immense benefit of oil importers, which are the nations that conduct virtually all technological innovation. The 2011 article was not the first time this subject of technological pressure rising in proportion to the degree of oil price excess has been addressed here at The Futurist. There were prior articles in 2007, as well as 2006 (twice). As production feverishly scales back, and some of the less central petrostates implode, oil prices will gradually rise back up, generally saturating at the $70 level (itself predicted in 2006) in order to deplete the remaining dollar-years. But we may never again see oil at such a high price relative to world GDP, as existed from most of 2007-14 (oil would have to be $200+/barrel today to surpass the record of $147 set in 2008, in proportion to World GDP). Note that I happen to be someone who actually does believe in Peak Oil theory, but that such a condition generates long-term positives that outweigh short-term negatives. 1) That rising oil prices do not cause a long-term downward adjustment in demand. Oil demand may be inelastic in the short-term, but in the long term, people will buy more efficient cars, carpool, ride bicycles, reduce discretionary trips, conduct more commerce online, etc. To assume otherwise is to ignore the most basic law of economics. This is before even accounting for the indirect benefits of declining oil demand such as a drop in traffic fatalities (which cost $2 million apiece to the economy), less wear and tear on roads and tires, less pollution, less real estate consumed by gas stations, less competition for parking spaces, etc. 2) That rising grain prices will not move consumption away from increasingly expensive meat towards affordable grains, fruits, and vegetables, thereby reducing grain and water demand. This, too, is economic illiteracy. If the price of beef triples while the price of rice and potatoes does not, consumption patterns shift. 4) That most economic growth is not in knowledge-based industries, which consume far less energy per dollar of output. The US economy today produces twice the financial output per unit of oil consumption as it did in 1975, with information technology rising as a portion of total economic output. 5) That a major economic downturn, featuring skyrocketing food prices for people in poorer countries, will somehow not translate to a lower birth rate that inhibits population growth and hence curbs demand, and that population projections will somehow not change. 6) That there will be no humans living beyond the Earth (whether in orbit or on the Moon) by 2040. The reason this point is relevant is because a society cannot advance in space travel without simultaneous advances in energy technology. I say that advances in photovoltaic efficiency make Lunar colonies closer to viability by that time. 7) That we are going to have over 30 years of negative growth in World GDP, despite not having had a single year of negative growth since 1973, and despite the trendline of growth solidly registering at 4.5% a year even today. I happen to think that by 2040, the world economy will be 4 times larger than it is today. Even the Great Depression was only 5 years of negative growth, followed by a recovery that elevated prosperity to levels higher than they were in 1929, at a time when World GDP was only at a trendline of 2% annual growth, or less than half the level of today. Yet Gail the Actuary thinks car ownership will no longer be affordable to most people by 2040. Peak oil may be on the horizon, but the US economy has already adapted to oil at sustained prices of $70 or $80/barrel (which is the biggest story that no one is noticing yet), and will soon adapt to $100/barrel. I want oil to hit a sustained $120/barrel by 2010 to start a virtuous cycle of technological and geopolitical chain reactions that make the world a better place in the long term. If oil hits $200/barrel, that will cause a deep recession that could last several years, but after that point, we will have adapted out of the oil burden almost entirely, and World GDP growth will resume at 5% a year. Why $70/barrel Oil is Good for America (February 1, 2006). $70+/Barrel Oil, the Non-Crisis (April 25, 2006). Terrorism, Oil, Globalization, and the Impact of Computing (August 22, 2006). When oil first hit $70/barrel nearly two years ago, there were widespread fears of the US economy tipping into recession. I pointed out that a much smaller piece of the US economy has exposure to oil than was the case in 1974 or 1981, which were the last times such high prices were seen (in inflation-adjusted terms). Google, Oracle, and VMWare are far less vulnerable to oil prices than General Motors and Federal Express. Sure enough, after 2 years of oil prices hovering around $70, the US economy has successfully adapted to it. The specter of the $70 barrier is behind us, permanently. This chart from the Bureau of Labor Statistics shows the annualized rate of oil price inflation over the last few years. Notice how the rise from $20 to $80 led to import price inflation (the blue line) touching 10% for three years. However, that rise is now behind us, with the settled price of $70/barrel or more no longer causing further inflation in the price of imported products. Even more striking is the shrinkage in the US trade deficit. 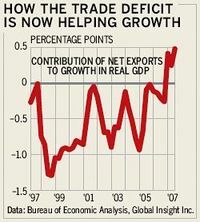 Despite oil imports being as much as one third of the US trade deficit of about $60 Billion/month, the trade deficit has actually shrunk since the peak of 2006, contributing positively to GDP growth for the first time in over a decade (chart from BusinessWeek). That the US economy can now take $70 and even $80 oil in stride is the biggest story that no one has noticed yet. However, $70 oil also fattens the coffers of the world's notorious 'Petrotyrants'. From Iran to Venezuela to Saudi Arabia to Russia, one can note that there is a rather close corelation between an economy being heavily dependent on oil exports and the leaders of that country resisting or even rescinding democracy. All of these articles were written within a 4-month period in early 2007. Both philosophies are true by themselves, but they are mutually exclusive. Mr. Friedman, what do you want? Higher oil prices or lower oil prices? But forget about Mr. Friedman wanting it both ways. Instead, I am going to go with the second choice, that of higher oil prices. I see this as a golden opportunity for permanent, far-reaching, multifaceted geopolitical change. The US economy has successfully adapted to a permanent $70/barrel oil price with almost no real pain, and thus it is the time to take the bull by the horns, and lure the Petrotyrants into the ultimate irreversible trap. It is time to hope that the price of oil rises to $120/barrel by 2010, and stays above that level permanently. Why, you may ask? Won't such a high price make Iran, Venezuela, Saudi Arabia, Russia, Nigeria, Sudan, Kazakhstan, and others even wealthier, without them having done anything to earn it? Won't it make Sudan more genocidal, and Iran more able to equip terrorists? Won't Saudi Arabia be able to fund even more Madrasas across the world? Sure it will, for a time. But consider the perils of burning the candle at both ends. But won't this also cause economic suffering in the US? For a time, yes. 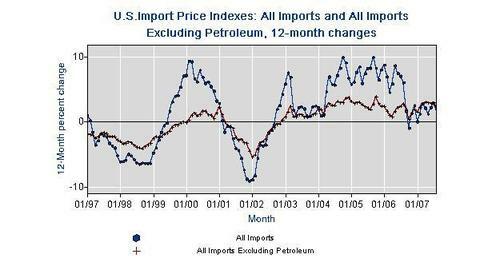 Gasoline will be at $5/gallon, and the trade deficit will temporarily widen. I claim the possible recession will be brief, if there even is one at all, as the run-up from the present price of $80/barrel up to $120/barrel is already less of a shock than the jump from $20 to $80 that we already have successfully sustained. I say all of this is worthwhile short-term pain, for when the quietly toiling engine of technological innovation emerges from its chrysalis, it will be gigantic. The technological climate of 2007 is very different from that of 1974 or 1981. There is so much breadth and depth in energy innovation right now, even at the present $70-$80/barrel, that $120/barrel will move the technology and economics of alternative energy into fast-forward. Currently, the petroleum market is shielded from exposure to both the electricity market and the agricultural market. However, upcoming electric and plug-in hybrid automobile technologies consume electricity at an equivalent cost of just $1/gallon. Furthermore, electricity can be generated from multiple sources that exist in almost every country, eliminating the weak position that oil importers are in relative to oil exporting nations. With gasoline at $5/gallon, consumers will migrate towards hybrids, plug-in hybrids, and electric vehicles so rapidly that the auto manufacturers will start engaging in aggressive competition to lower prices and accelerate innovation. This will greatly widen the fronts at which the oil market is exposed to the far cheaper and decentralized electricity market. This spells trouble for oil producers who have to compete with electricity that is 3-5X cheaper in providing the same transportation. Simultaneously, cellulostic and algae-derived ethanol research efforts will get supercharged, greatly increasing the probability of a breakthrough that enables the attractive math of cellulose or algae to replace the unimpressive economics of corn ethanol. If ethanol from switchgrass or algae is more compelling than oil at $120/barrel, oil has yet another enemy in addition to electricity. The combination of electric vehicle and cellulose/algae ethanol technologies will act as a 1-2 punch to slash the consumption of oil across both the US and China permanently within just a few short years. Then, the fun begins. The terrorists and despots who got lured into profligate spending under $120 oil will eventually find that the demand for their exports is plummeting. Furthermore, the thing about subsidies such as those that Iran doles out is that they are self-propagating. Note that in 2005, Iran exported $44 billion in oil, but spent $25 billion in subsidies, meaning that if oil fell to $30/barrel, Iran's export revenue would effectively become zero if the same level of subsidies are maintained. 34 cent/gallon gasoline leads to more car purchases and hence more demand for gasoline, increasing the cost of maintaining the subsidies, and hence the oil price floor at which Iran's export revenues would shrink to zero. At $120/barrel, the subsidy obligation will be so burdensome that even a drop back down to $70/barrel would lead to a revenue falling behind expenses. At the same time, China will have no choice but to aid in the hastening of these technological advances, as they will have to shift their priorities from locking up oil contracts to reducing the crushing cost of oil imports at $120/barrel. On the other hand, if oil stays at or below $70/barrel for the long term, Petrotyrants will survive to continue their nefarious activities for at least another 20 years to come. China, too, will continue their current stance of propping up Petrotyrants. Thus, I say bring $120 on. We outspent the Soviet Union on defense, and we can outspend the Petrotyrants while setting them up for an inevitable cornering and collapse. Give me $120/barrel oil by 2010, and I will give you the demise of Petrotyranny in Russia, Iran, and Venezuela by 2015. Count on it. Update (10/19/07) : We're up to $90/barrel already! While there will be ups and downs in the traded daily price, and the gloomy media coverage might appear frightening, be patient and disciplined. The short-term pain will lead to permanent long-term gain. Update (5/22/08) : Oil has crossed $120/barrel, and is currently as high as $133. Such a rapid rise usually is followed by a precipitous drop, and we need the price to stay above $120 for an extended period to realize the benefits described in the article. I might do a v 2.0 in 2008 itself if the price stays high. As you may have heard by now, in 2007, China is set to surpass the US in the emission of greenhouse gases. This has many implications for the concept of environmentalism, and for the geopolitical landscape. China takes 4.3 times as much energy as the US to produce each dollar of GDP. Thus, China, with an economy less than a fourth the size of the US, already emits more. It is true that China's per capita emissions are much lower than the US due to China's much greater population. However, the US is not the highest in per capita emissions either. Small nations like Canada and Norway top that list. Now consider the implications of this for the near future. By 2012, China's emissions will be a clear 20% higher than the US, which is a delta too large to ignore. The environmental movement has some people (like Thomas Friedman) who genuinely care about reducing pollution. However, a large subset are merely anti-US, anti-capitalism radicals who seek to mask their agenda within the altruism of environmental concerns. A beloved non-Western, undemocratic nation being a bigger polluter than the US is simply too inconvenient of a reality for their agenda. This will split the environmental group into two opposing factions - those who truly seek to curb emissions worldwide, and those who are merely driven by anti-Americanism and anti-capitalism. This civil war will be interesting, to say the least, and the purging of the phonies could just be the best thing to happen to the environmental movement, making it palatable enough for greater participation from mainstream people. Furthermore, this is an example of point 10) in my essay on Why the US Will Still be the Only Superpower in 2030. China is not prepared for the burdens of being the primary recipient for blame on a major global issue. As the heat on the US reduces at China's expense, China will find that the upper rungs on the ladder to superpowerdom bring the attachment of heavy weights that make each subsequent rung increasingly difficult to scale. Getting to the top is just not as easy as it may seem, as China will continue to discover. There are many independent streams of technological progress currently underway in the field of energy. I have written several individual articles on various breakthroughs in lighting, electic cars, ethanol, etc. But the time has come for a 'grand unifying' article that combines these seemingly unrelated innovations into a timeline for when we can expect which advances to have a measurable impact. I hereby present a possible future timeline for disruptive improvements in energy technology, economics, and mass market adoption. 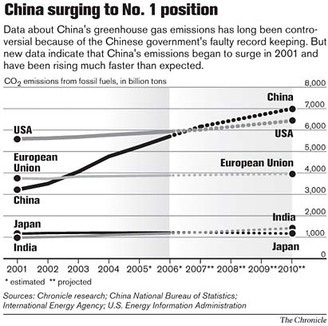 2007 : China's greenhouse gas emissions surpass that of the US. China requires 4.3 times as much energy as the US to produce each dollar of GDP. 2007-09 : Compact Fluorescent Lightbulbs and Light Emitting Diodes begin to replace incandescent bulbs across the US. By 2010, the typical US household is saving over $100 per year in electricity costs. 2007-10 : Corn-based ethanol continues to generate only a small percentage of vehicle fuel in the US, despite the governmental support behind it. 2009 : The Automotive X-Prize of $25 Million (or more) is successfully claimed by a car designed to meet the 100 mpg/mass-producable goal set by the X Prize Foundation. 2010 : Hybrid, plug-in hybrid, and fully electrical cars represent 5% of total new automobiles sold in the US, even if tax incentives have been a large stimulus. There are concerns about the load on the electrical grid from all of these new cars drawing power from ordinary home outlets, but given the massive reduction in household electricity consumed by lighting, this surplus nicely offsets the electrical demands of plug-in cars. 2011 : Thousands of wind turbines have been erected across Alaska, Canada, Russia, and the northern waters of Europe by now. Some European countries now derive over 25% of their electricity from wind. 2012 : Cellulostic ethanol technology becomes cost-effective and scalable. Biomass-derived fueling stations finally begin to find their way into most US population centers, but still displace only 15-20% of US gasoline consumption. New oil extraction technologies continue to exert downward pressure on oil prices, resulting in a continual tussle between biomass fuel and oil-derived fuel for cost competitiveness. All of this is bad news for oil-producing dictatorships. 2013 : Tesla Motors releases a fully electric 4-door sedan that is available for just $40,000, which is only 33% more than the $30,000 that the typical fully-loaded gasoline-only V6 Accord or Camry sells for in 2013. 2014 : Solar panels have become inexpensive enough for a typical house in California or Arizona to financially break even in under 5 years after installation, even after accounting for the cost of capital. Over 3 million US single-family homes have solar panels on their rooftops by now, and many of these homes are able to charge up their plug-in hybrids or fully electric vehicles entirely free of cost. 2015 : As predicted in early 2006 on The Futurist, a 4-door sedan with a 240 hp engine, yet costing only 5 cents/mile to operate (the equivalent of 60 mpg of gasoline), is widely available for $35,000 (which is within the middle-class price band by 2015 under moderate assumptions for economic growth). This is the result of not only energy innovation, but also lighter, stronger nanomaterials being used in some body components, as well as computerized systems that make energy usage more efficient within the car. 2016 : Large industrial-grade solar panels, enhanced with nanotechnology, achieve unprecedented conversion rates of solar energy to electricity. 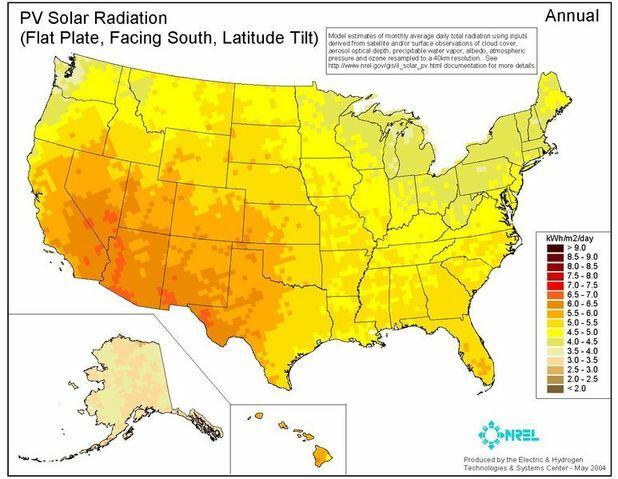 The US has completed the construction of major solar farms in California, Nevada, and Arizona, collectively covering hundreds of square miles of desert land. Similar farms are under construction in Australia, India, Saudi Arabia, Iraq, and Sahara Desert countries. 10% of world electricity demand is now met through photovoltaics. 2020 : Gasoline fuels under one third of the passenger car miles driven in the US. Electricity and biomass fuels account for the remaining two-thirds, with electricity being the one crowding the other two out (electricity itself is primarily derived through solar, wind, and nuclear sources by now). US total oil consumption, in barrels, has decreased only somewhat, however, due to commercial airline flights (which still use petroleum-derived fuels). At the same time, oil consumption in relation to total US GDP is actually under half of what it was in 2007. 2025-30 : Electricity (indeed, clean electricity) now fuels nearly all passenger car miles driven in the US. There is no longer any significant fuel consumption cost associated with driving a car, although battery maintenance is a new aspect of car ownership. The average car weighs only 60% as much as the 2007 counterpart, but yet is over twice as resistant to dents. Most cars are self-driven by on-board intelligence, so human drivers can literally sleep in the car while being delivered to their destination. Wind, solar, and nuclear technologies collectively generate 75% of the world's electricity needs. Crude oil is, however, still used to create jet fuel. Since some passenger jets are capable of hypersonic speeds, oil consumption remains significant in this area. Worldwide energy consumption is now 75% higher than what it was in 2007, moving us from 0.71 to 0.74 on the Kardashev scale. Is this timeline too optimistic? I found this research report from Clean Edge that goes out to 2016, and they project that renewable energy industry revenue will grow by 15% a year from 2006 to 2016. Let's see how closely reality matches this timeline. Update (9/15/07) : Seven months after I created this timeline, BusinessWeek has a slideshow that predicts the impact of many of the same technologies. In fact, CFLs, LEDs, the Tesla Roadster, Plug-in Hybrids, etc. are all items I wrote about even earlier. On September 5, we had an article titled The Imminent Revolution in Lighting, and Why it is More Important Than You Think, which described the massive change the economics of lighting will experience in the next few years. 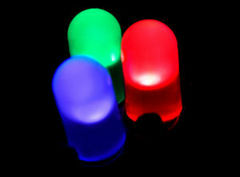 I would like to also add this article from MIT Technology Review, about advances in silicon-based white-light LEDs. 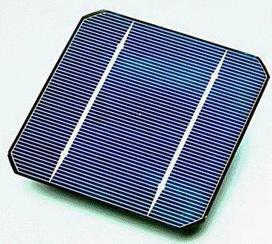 The article explains how the low cost of silicon, combined with the massive infrastructure already in place to process silicon into electronic and solar-cell products, provides a catalyst for this innovation to reach mass-market adoption sooner than others. These LEDs could potentially use just one tenth the electricity of traditional incandescent bulbs, yet last 50 times longer. The point that many miss, however, is not whether this technology supplants compact fluorescent bulbs (CFLs), or whether another form of LED technology wins out. The point is that there is rapid innovation in many unrelated technologies trying to address the same goal. This much competition and participation inevitably leads to high-impact innovations that benefit society immensely. As stated before, the energy problem will be killed by a thousand cuts, of which this is one. There is an article from Larry Kudlow today predicting a drop in oil prices in the near future. Kudlow's prediction is derived from economic data indicating higher oil supplies in the near future, an increase in exploration and drilling by oil companies, and new legislation favoring drilling. Given that Kudlow is usually right about most of his near-term economic predictions and points to several factors contributing to the possible drop, rather than just one, this could very well turn out to be accurate. However, if prices were to return to lower levels, it is actually not very good for the United States in the long term. I believe that $70/barrel for oil is the optimal price at which energy innovation can accelerate without tipping the US economy into recession. Technologies such as ethanol and tar-sand refineries become cost-effective when oil is above $70, but if oil returns to lower prices, this innovation will stagnate once again. A chart of oil prices (wikipedia) indicates that in the last 120 years, only for a 4-year period from 1977 to 1981 was the real price of oil higher than it is today. Today's price is higher than it has been for 116 of the last 120 years. While the 1977-81 price spike caused a painful recession, it fostered significant innovation in engine efficiency and alternative energy. As oil prices dropped and remained low during the 1980s and 90s, innovation slowed. Click on the chart to make it bigger. The US economy will not be able to reduce our dependence on foreign oil, and significanly reduce the pollution of oil consumption, without a multi-year period of oil above $70/barrel. This will be painful, but is the only way to enable the free market to achieve this necessary goal. The coming jump in energy technology. Humans are not rational beings. This is evidenced by how much agony there is over having to pay $500 more per year on gasoline than initially expected, against the relatively muted criticism towards real estate agents charging $10,000 to $60,000 for their services, or income tax preparation consuming over 10 hours of time per household per year (is 10 hours worth so much less than $500)? I have written before about why $70/barrel oil is good for America, as it will accelerate technological progress in energy. In fact, it already has begun to do this. But yet another interesting thought arises. Expensive oil affects the price of many things, as it inherently raises the cost of moving an object from one place to another. Corporations that need to do a lot of this, such as Wal-Mart, Federal Express, or United Airlines, see their costs rise, and have to both raise their prices and trim their staffing levels. Other countries also have such industries, and are also hit by higher oil prices. Countries that many fear will overtake the United States, such as India and China, have economies even more dependent on oil than the US. Sectors like automobiles, steel, aluminum, airlines, and concrete are actually growth industries in India and China, where the majority of people are yet to become consumers. If half of the people who have cars today did not have cars five years ago, then the increase in gasoline costs is a much larger percentage of their income than it is for an American. $500 a year more for gasoline actually is a lot for those who make $10,000 a year and just bought their very first car. Chinese and Indian consumer spending is much more sensitive to $70 oil than US consumer spending is. At the same time, US corporations such as Google, Yahoo, Goldman Sachs, Pixar, Citigroup, or Oracle are much less vulnerable to high oil prices. Yet, these knowledge-based businesses are the ones that have created most of the new wealth in the US during the last 25 years, and are the industries in which America's dominance over the rest of the world is the largest. So in conclusion, high oil prices hurts some of our industries, but it hurts those industries in other countries to the same degree if not more, and the industries which are less affected by high oil prices are already the industries in which America is ridiculously far ahead of the rest of the world. So high oil prices actually increase the gap between the US economy and those that would seek to catch up to it. If oil hits $100/barrel, US GDP growth may drop from 3.5% to 2%, but China's GDP growth may drop from 10% to 4%. Why $70/barrel oil is good for America. My prediction is that the burden of high energy prices and reliance on unsavory regimes that we currently face will have some serious scares in the next few years, but will abate and no longer be a major crisis by 2015, due to rapid advances in many new areas of technology. I claim that there will be no single technology that saves us, but rather many fields of innovation that slay the monster with a thousand small cuts. A new method of converting previously unusable husks and stalks to ethanol. A business renting out biodiesel cars in Los Angeles sets up shop. GE has created a machine that cuts the cost of producing hydrogen fuel by more than half. 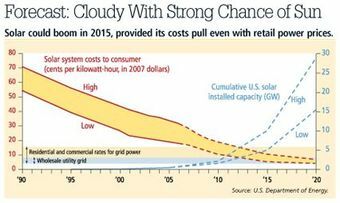 Solar energy costs are dropping quickly. The reason this is happening now instead of at any time over the last 30 years is because solar cells are made of the same materials that computational chips are made of, and thus inevitably converge into The Impact of Computing. A startup attempting to make a 330 MPG hybrid. Another attempting to reach 250 MPG. While this may be unrealistic, if they make even moderate progress, their IP would be sold and used elsewhere. None of these will singlehandedly change the world. However, each bit of innovation makes the economics of the whole ecosystem a tiny bit better, which cumulatively adds up to a lot. I have no hesitations in predicting that the average-priced 2015 model family sedan, with a 240 hp engine, will deliver 60 MPG. On top of this, the fuel itself may have a large ethanol component, and will contain much less gasoline per gallon than today. Some people say ethanol is the answer. Others say solar. Still others say wind, while yet others say that more sophisticated technology in the car itself and big light-emitting-diodes in the home can reduce oil consumption to the point that it doesn't matter. Will any one of them revolutionize the world in ten years? Probably not. The point is, there is not just one thing being worked on to kill the monster of US oil dependency, but many. The monster will be killed by a thousand cuts. An article on Winds of Change about the 8 possible alternative energy technologies. An article in Fortune about ethanol. Many people are pessimistic, after the lack of progress over the last 30+ years. However, the amount of energy-related murmurs in the blogosphere is trending higher, and the number of public and private energy initiatives, including venture capital going to energy, is much higher than even a couple of years ago. There is a more than fair chance that the cocktail of accelerating, exponential innovation, market forces, and renewed political interest in energy innovation is building a head of steam. I have commented recently on why $70 oil is good for America. I'm convinced that the world of 2015 will have had substantial jumps in energy technology from where we are today, not the least of which will be the typical 2015-model middle-class family sedan offering 60 mpg despite having a 240 hp engine. It is always darkest before the dawn..
After President Bush's SOTU address last night, his Energy Initiative may not be what gets the mainstream excited. After all, every President since Nixon has announced a desire to free America from dependence on foreign oil, and while there have been tiny steps of progress towards this, it has taken so long that few will believe that it will be any different this time. However, I will come out and say that the next 10 years will, in fact, be different. Here's why. When oil spiked in 1973 after the Yom Kippur War to a price that would be the equivalent of $90/barrel today, this caused a world-wide recession, including a very deep recession in the US. Most of the US economy was still dependent on manufacturing, with information technology being a miniscule sector. However, at $67/barrel today, we are only seeing a slight economic slowdown, and even if prices were to rise to $90/barrel today, we still would not dip into recession through that alone, as the US economy has evolved to the extent of being only about one-third as intrinsically bound to oil consumption as 32 years ago. The US economy produces 2.5 times as much economic output per barrel of oil, as in 1973. We are already evolving towards making our vulnerability to oil prices an asymptotically dwindling problem. This is accelerating as advances in information technology accelerate. This is why world economic growth is accelerating at ever-increasing speeds. High oil prices today are not triggering one solution to the problem, but many. At a sustained $70/barrel, numerous alternatives, like ethanol, Canadian tar sands, Colorado oil shale, solar power, etc. become much closer to cost-competitiveness. They were not options in 1973. In addition, this market force has caused the stagnant innovation we have seen in automobile technology during the era of cheap gasoline to awake from its slumber. The real story behind all the buzz behind hybird vehicles is that the cost delta between a hybrid and traditional vehicle is now under 15% of the vehicle's price, and dropping. In about 10 years, the term 'hybrid' will not exist at all, as that technology will merely be a standard feature in all cars. Credit goes to President Bush for increasing funding for basic research in energy technology. While this will not deliver benefits during his remaining time in office, it will bring us large dividends by 2015. Prediction : Despite several scares in the next 2-4 years, by 2015, oil prices will not worry people nearly as much anymore, whatever the price of oil at the time. A much smaller portion of the US economy will be tied to oil prices. This new reality will be visible in many places, such as the typical 2015-model family car yielding 60 MPG (highway) despite having a 240 hp engine. Gas at $4/gallon is not so bad, if you only need 5 gallons a week.